At first glance the sanders in the entry-levelsegment of the 5" random orbit sander market appear to be verysimilar. All of them are roughly the same size and shape, and theirspecs do not differ all that much. 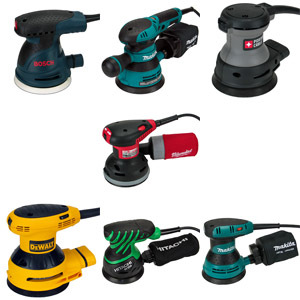 The BO5031K random orbit sander is a favoriteamong users on the internet. It seems to perform well for justabout everyone. I really liked its bigger brother, the BO5041K,when I reviewed it in my workshop. Let's take a look if the BO5031Kis the great all-rounder it is said to be, or if the voices on theinternet got this one wrong like they so often do. Another week, another sander. 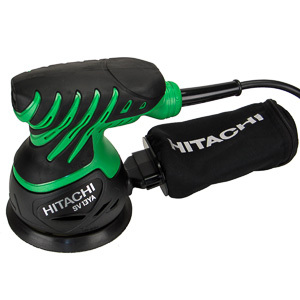 This week theHitachi SV13YA random orbit sander makes an appearance on theHingmy test bench. This one looks like the rest of them, exceptthat it is green. Let take a look what the SV13YA can bring to therandom orbit sander market, and if it should have a spot in yourtool chest. This week the ROS20VS made an unscheduledappearance in my shop. The tool I wanted to review in its placearrived in broken condition. 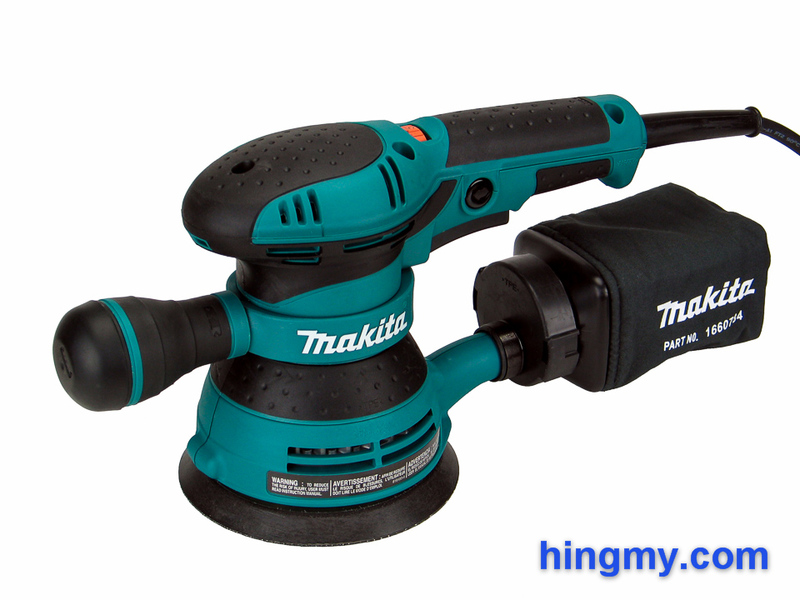 While that is unfortunate, it gives mechance to continue my quest to review every orbital sander on themarket today. Let's take a look at what the ROS20VS brings to the5" sander market, and figure out, if it is a good addition to yourshop. The Makita BO5041K caught my eye the instant Isaw it. 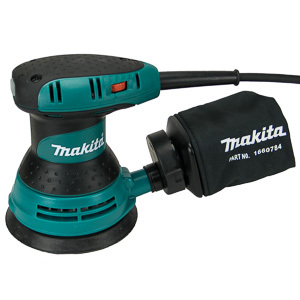 It looks like a compact random orbit sander with a coupleof handles glued on. 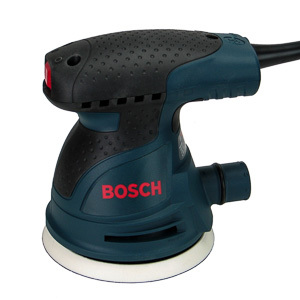 Since a lot of the work I do in my woodshopinvolves hours of sanding, I ordered a BO5041K for a test driver.Let's take a look at this novel design and find out if it makes theBO5041K a better compact sander. Orbital sanders create a scratch free finish by moving the sanding pad in a random pattern. They are best used for doing fine sanding passes. The pad of a random orbit sander not only rotates, but also moves side to side slightly. The two motions combine to create a "random" pattern. This pattern eliminates deep scratches that can appear when using the other types of sanders in a single direction for too long. Larger orbits and higher speeds increase the sanding speed of the sander. Disk size significantly increase the productivity of the tool, since the outer edges of the pad move significantly faster as the diameter increases. Orbital sanders are not good at rapid stock removal. Use a belt sander for this feature. Sanding performance falls of near the rim of the sanding disk due to imperfect downward pressure in that area. It is very difficult to sanding up to edges and into corners with an orbital sander and produce a consistent finish. The palm sander with its square sanding pad is the better choice of tool for this task. "Good general purpose ROS. Easy to hold, plenty of power. Dust collection works pretty well. Rubber-booted switch can be difficult to operate without fumbling." 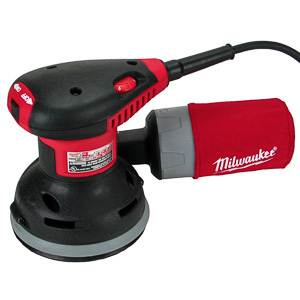 "A great, durable, and powerful sander at full speed with a novel and useful grip. Vibration is an issue at slow speed. Dust collection performance is average."